Üsküdar Ahmet III Fountain is located in Üsküdar Square across from the quay, which was built near the shore to serve passengers traveling accross the Bosphorus by Sultan Ahmet III in 1728. It has arrived in its present location during the square planar arrangement. 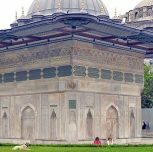 The fountain is made of solid marble, and inscribed on the side facing the square are verses by the famous Divan poet, Nedim. On the wall facing the mosque there are excerpts from the poet Rahmi, and on another wall are those from the poet Shakir. 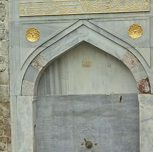 On the wall facing the Bosphorus one can read verses inspired by Ahmed III and his son-in-law, Nevşehirli Ibrahim Paşa, written in calligraphy by Ahmet III. There are many aspects and adornments of this fountain that give it a very different complexion. Among these are the many S and C curves used in its design, its badges on the niches of the polygonal prisma body, and how its polygonal body turns into square prisma after a certain height. A number of vases on which tulips, roses and chrysanthemums are used as motifs, used to decorate the side of the fountain, are viewed as the most beautiful samples of artistic workmanship on the fountain. 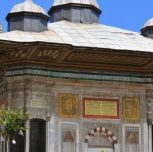 In addition, other architectural beauties, such as muqarnases (a three-dimentional decoration of Islam architecture), lancet arches, and palmets add a brilliant aesthetic value to the fountain. 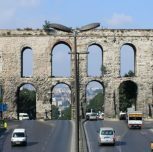 Today, the Fountain, which is located on the Main Street of Üsküdar where Hakimiyeti Milliye Street and Paşalimanı Street intersect, is one of the most beautiful fountains of Istanbul.